Planning an event can be difficult... and annoying. After your attendees approve time slots, you can view your event and see which time was MOST approved, and pick a time slot that works best for everyone involved. I was a little too ambitious when I set out to create this app from scratch in less than a week... so it doesn't have all the functionality I originally planned... YET! I've gotta give it up to my incredibly brilliant WDI instructors here at General Assembly who taught me how to build an app from scratch using Rails: @jim-clark and @jtamsut. I am so grateful for their wise advice and hours of direction while building the app. 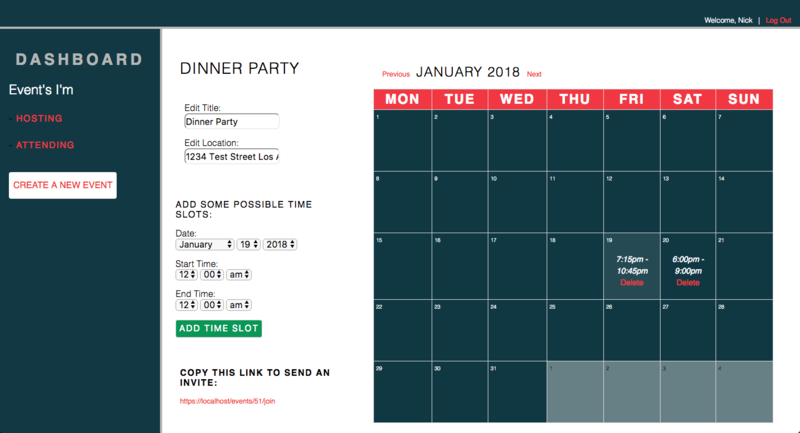 Also big thanks to @excid3 for the "Simple Calendar" gem, which made this project so much easier.